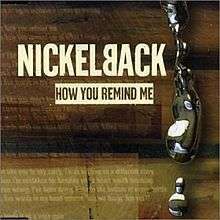 (2000) "How You Remind Me"
"How You Remind Me" is a song by Canadian rock band Nickelback. It was released on August 21, 2001 as the lead single from their third studio album Silver Side Up (2001). A "Gold Mix" was made for latter editions of the single with the heavier guitars edited out of the chorus. Lead vocalist and guitarist Chad Kroeger wrote the song about his old girlfriend Jodi, with whom he had a dysfunctional relationship. He refers to this song as the song that put Nickelback on the map when played at their concert in Sturgis, South Dakota. It is often considered to be their signature song. "How You Remind Me" was named the number one most played song on U.S. radio of the 2000s decade by Nielsen Soundscan, being spun over 1.2 million times on U.S. airwaves since its release in 2001 to the end of 2009. The song was named fourth on the Billboard Hot 100 Songs of the Decade and 75th in the UK decade-end chart. It was nominated for the Kerrang! Award for Best Single. "How You Remind Me" was also rated the number one rock song and number 4 alternative song of the decade of the 2000s by Billboard. The song was featured in the music video game Guitar Hero: Warriors of Rock. The music video for "How You Remind Me" featured Nickelback playing a small venue with focus on a female audience member. Chad Kroeger admitted to disliking the idea of a small venue performance at first, opting for a bigger scale arena concert; however, he found the outcome of the video satisfying. In the video, Kroeger plays a man whose girlfriend (played by model Annie Henley) has left him and is still haunted by her memory. He still feels strongly for her, and sees her everywhere he goes. Whenever he imagines her touch, he feels a warm memory, indicated by the change in lighting in the video. As the music video progresses, he starts to get over her. At the end, she shows up and apparently asks him to forgive her. This is what he thought he had wanted all along, but suddenly he realizes that it isn't really what he wanted, and pushes her away. She is left with a broken heart and haunted by memories, as he had been at the beginning of the video. Another version of the video exists, and has been played on some UK and Australian music channels. The video simply features the footage of the band playing from the main video, added to footage of the band's live performances and tour movies. Due to its high sales and massive airplay, "How You Remind Me" was ranked as the top single of 2002 by Billboard magazine. The single was certified Gold by the RIAA in 2005, for sales of over 500,000 copies, and by late 2010 it had sold around 860,000 copies total. The song went on to rack up four Billboard Music Awards, four Juno Awards. "How You Remind Me" was the number one Most Played Song of 2002 in the United States, across all formats, according to Billboard Monitor. In 2003, the song was nominated for Grammy Award for Record of the Year. "How You Remind Me" was the number one song on the Billboard's 2002 Year-End Hot 100 Singles Chart, and VH1 ranked the song as the 16th Greatest Power Ballad. The song was listed at number 36 on Billboard's All Time Top 100. The song also hit number one on the Kerrang! feature, 21st Century's Official 100 Rock Best Sellers. The song was the 75th best-selling single of the 2000s in the UK. In Germany, it's not just the band's best-charting single by reaching number 3 on the German Singles Chart, it's also Nickelback's longest-staying single on that chart, namely a total of 30 weeks. In 2011, Fuse TV named it the number one song of the decade. It was listed as number 9 at the Billboard Hot 100 top 100 Rock Songs of the last 50 years. Loudwire listed the song as number 30 on its list "Top 21st Century Hard Rock Songs". "How You Remind Me" was recorded by Kroeger's wife Avril Lavigne for the anime film One Piece Film: Z. It was reported on 17 October 2012 that Lavigne would be contributing two cover songs to the film: the latter track and a cover of Joan Jett's "Bad Reputation". Lavigne later confirmed the new recording on 5 November 2012. It was released on 11 December 2012 as a digital download from the One Piece Film: Z Original Soundtrack. The 2-track promotional CD single was released on the next day, exclusive to Japan. The song was re-released on 19 December 2013 by iTunes Stores as a digital download promotional single for her self-titled fifth album. Later, it was included in the Japan, Taiwan and China Tour Edition of the album as one of the bonus tracks. Lavigne was in the studio with Kroeger working on her fifth studio album when she was asked to contribute a song to the film, but didn't have time to write another song during the studio sessions they had left. Kroeger later commented: "Avril jokingly suggested to cover a Nickelback song, but then we both figured it'd actually be a good idea to do "How You Remind Me". We recorded a version more similar to the original, but we both were not happy with it, thinking it needs its own spin. Avril then rearranged the song and we all liked it". An audio-only video was put on Lavigne's official Vevo on 8 January 2013. ↑ "Eminem Is The Best-Selling Artist Of The Decade - Music, Celebrity, Artist News". MTV. 2009-12-08. Retrieved 2012-02-22. ↑ "The Greatest | Show Cast, Episodes, Guides, Trailers, Web Exclusives, Previews". VH1.com. Retrieved 2012-02-22. ↑ "Die ganze Musik im Internet: Charts, News, Neuerscheinungen, Tickets, Genres, Genresuche, Genrelexikon, Künstler-Suche, Musik-Suche, Track-Suche, Ticket-Suche". musicline.de. Retrieved 2012-02-22. ↑ "Australian-charts.com – Nickelback – How You Remind Me". ARIA Top 50 Singles. ↑ "Austriancharts.at – Nickelback – How You Remind Me" (in German). Ö3 Austria Top 40. ↑ "Ultratop.be – Nickelback – How You Remind Me" (in Dutch). Ultratop 50. ↑ "Ultratop.be – Nickelback – How You Remind Me" (in French). Ultratop 50. ↑ "Danishcharts.com – Nickelback – How You Remind Me". Tracklisten. ↑ "Nickelback: How You Remind Me" (in Finnish). Musiikkituottajat – IFPI Finland. ↑ "Lescharts.com – Nickelback – How You Remind Me" (in French). Les classement single. ↑ "Musicline.de – Nickelback Single-Chartverfolgung" (in German). Media Control Charts. PhonoNet GmbH. ↑ "Italiancharts.com – Nickelback – How You Remind Me". Top Digital Download. ↑ "Nederlandse Top 40 – Nickelback search results" (in Dutch) Dutch Top 40. ↑ "Charts.org.nz – Nickelback – How You Remind Me". Top 40 Singles. ↑ "Norwegiancharts.com – Nickelback – How You Remind Me". VG-lista. ↑ "Swedishcharts.com – Nickelback – How You Remind Me". Singles Top 100. ↑ "Swisscharts.com – Nickelback – How You Remind Me". Swiss Singles Chart. ↑ "Archive Chart: 2002-03-10" UK Rock Chart. ↑ "Archive Chart: 2002-03-10" UK Singles Chart. ↑ story "Billboard Adult Pop Songs" Check |url= value (help). Billboard.com. Retrieved October 20, 2011. ↑ story "BillBoard Pop Songs" Check |url= value (help). Billboard.com. Retrieved October 20, 2011. ↑ "Listy bestsellerów, wyróżnienia :: Związek Producentów Audio-Video". Polish Airplay Top 100. Retrieved August 22, 2016. ↑ "Single top 100 over 2002" (PDF) (in Dutch). Top40. Retrieved 2 May 2010. ↑ "ARIA Charts – Accreditations – 2001 Singles". Australian Recording Industry Association. Retrieved 8 August 2008. ↑ "Ultratop − Goud en Platina – 2002". Ultratop & Hung Medien / hitparade.ch. Retrieved 8 August 2008. ↑ "French single certifications – Nickelback – How You Remind Me" (in French). Syndicat National de l'Édition Phonographique. Retrieved 1 August 2008. ↑ "Gold-/Platin-Datenbank (Nickelback; 'How You Remind Me')" (in German). Bundesverband Musikindustrie. Retrieved 8 August 2008. ↑ "The Official Swiss Charts and Music Community: Awards (Nickelback; 'How You Remind Me')". IFPI Switzerland. Hung Medien. Retrieved 8 August 2008. ↑ "Canadian Singer Avril Lavigne Contributes One Piece Film Z Themes". Anime News Network. 2012-10-17. Retrieved 2012-11-23. ↑ "Twitter / AvrilLavigne". Twitter. Retrieved 21 December 2012. ↑ "One Piece Film Z Soundtrack". CDJapan.co.jp. Retrieved August 22, 2013. 1 2 3 "Avril Lavigne – How You Remind Me". Discogs. Retrieved 12 December 2012. 1 2 3 "How You Remind Me - Single by Avril Lavigne". US: iTunes Store. Archived from the original on January 27, 2015. Retrieved December 19, 2013. ↑ "艾薇儿 Avril Lavigne:同名专辑 中国巡演限量版 China Version(2CD 附中国巡演限量周边毛巾)". Amazon.cn. Retrieved March 4, 2014. ↑ "Chad talks about Avril Lavigne covering one of his tunes". Archived from the original on 12 January 2016. Retrieved 23 January 2013. ↑ "Avril Lavigne - How You Remind Me". YouTube. Retrieved 8 January 2013. 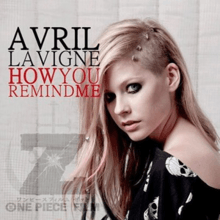 ↑ "How You Remind Me - Single by Avril Lavigne". Canada: iTunes Store. Archived from the original on January 27, 2015. Retrieved December 19, 2013.